A spokesperson for Olympus has said that he believes the number of lenses available for its range of Micro Four Thirds cameras gives it the edge over competitors. Olympus announced the Olympus OM-D EM-5 last week after weeks of speculation and rumour, bring the total number of mirrorless models currently in the Olympus range to four. Last year, its PEN series of cameras updated to its present three models, which includes the Olympus PEN E-P3. 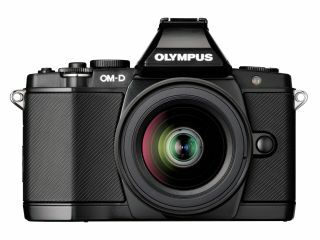 Speaking to TechRadar, Mark Thackara, UK marketing manager for Olympus said, "Now the OM-D is out, we've got the advantage. We give people a lot of choice and there's a lot of lenses to choose from." Thackara believes that customers for the OM-D will be both existing Olympus users and those looking for a "serious" compact system camera. "Up until now the serious lenses [in the Olympus range] hadn't really had a camera to go with them, it's fair to say," Thackara explained. "While the E-P3 is a good partner for some of them, a lot of people who buy that don't want to buy extra lenses, but I think the new camera will do a lot better for us in terms of accessory sales." Thackara said that lens sales were generally good, but admitted they could do better. "We need to produce lenses at prices that are very attractively priced, and that will make a big difference." Most of the major camera manufacturers have a compact system camera in the market now, with some providing more lens choice than others. Nikon's 1 system has a fairly limited range to choose from, but it does allow (via an adapter) for Nikon DSLR lenses to be used with the camera. Sony's NEX range is in a similar position, although it did announce its NEX lens line-up for the next 12 months at the CP+ show in Japan last week. The E-M5 is thought to be the first camera that Olympus will produce in an ongoing OM-D line up. "The biggest clue is the lens line-up," Thackara told us. "Some of the other compact system cameras have a very limited range of dedicated lenses, whereas we have now offer a choice of around 20, it's a very good range of options and some of them are pretty serious." As Olympus cameras come under the Micro Four Thirds banner that was developed in conjunction with Panasonic, OM-D and PEN cameras are also compatible with Panasonic's lenses. The OM-D E-M5 was announced last week and will be available to buy from April, with a retail price of £1149.